This is a wonderful traditional soup from the Himalayas. After I started to read about it, I discovered several variation on the net. 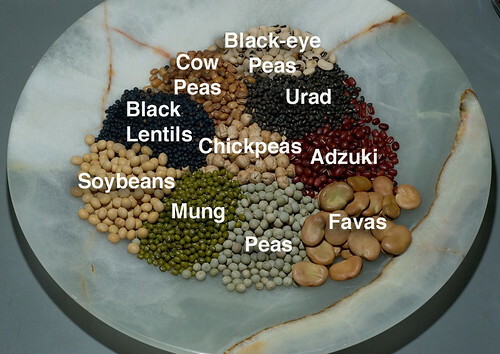 The common threads are the use of a variety of beans including some lentils and peas, that they be sprouted before cooking, and that it is a curry. This recipe is from the Joys of Nepalese Cooking, by Indra Majupuria, a wonderful little treasure I found in a used bookstore. There it is called “Hot Beverage of Pulses and Beans”, or Kwati, from Nepal. It is made for a religious festival. And it is so beautiful to make that it inspired the series of photos below. If you have a pressure cooker, it works beautifully for this recipe, but it is not required. 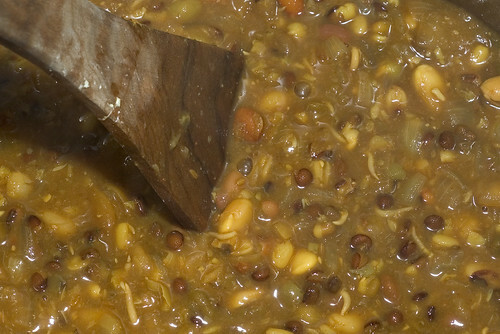 Soak the beans, peas and lentils in water for at least 24 hours. Drain and keep in a warm place for about 24 hours, until they’ve begun to sprout. Wash again before cooking. In the pressure cooker it you’re using it, in a stockpot if not, saute the onion in the mustard oil. When translucent and beginning to turn golden, add the garlic, bay leaves, and fenugreek seeds. When the onions are golden, add the sprouted beans and saute briefly before adding the spices and stock. Simmer until the beans are soft (30-45 minutes in a stock pot, 15 minutes under pressure in the pressure cooker. Fry the ajwain seeds in ghee or oil until they blacken. Stir into the finished soup and let sit a few minutes to meld the flavors. One suggested variation includes chopped spiced meat wrapped in a dough, dropped and cooked in the soup as dumplings. 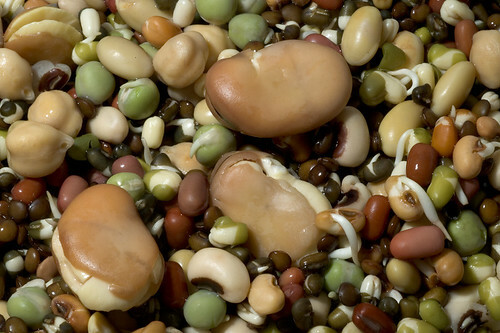 The beans suggesed appear to be commonly available in the Himalaya, but not all are easy to find here in the U.S. Another version I found suggested an easier mix of kidney beans, black-eyed beans, chickpeas, soy beans, mung beans, green beans, black beans, white beans, and red beans.